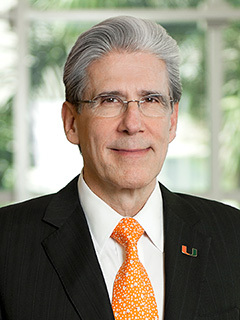 Dr. Frenk became the sixth president of the University of Miami in August of 2015. He also holds academic appointments as Professor of Public Health Sciences at the Leonard M. Miller School of Medicine and as Professor of Health Sector Management and Policy at the School of Business Administration. Dr. Frenk holds a medical degree from the National University of Mexico, as well as a master of public health and a joint Ph.D. in Medical Care Organization and in Sociology from the University of Michigan. He has received honorary degrees from seven universities.